Update 2017: Due to the popularity of this article, we have published an in-depth article about acupuncture points/meridians. Enjoy! To understand the basics of acupuncture, it helps to familiarize yourself with the acupuncture points chart. The number of acupuncture points was originally established to correspond to the number of days in the year: 365. These points were mapped to 14 major channel lines, one channel for each of the 12 inner organs, one channel along the spine (called the governing vessel), and another along the midline of the abdomen (called the conception vessel). Over time, the number of points identified by acupuncturists has expanded, expanding the acupuncture points chart. There are additional channels with their own sets of points, special points located off channels and complete maps of body structures by points along the ears, nose, scalp, hands, feet, wrists and ankles. 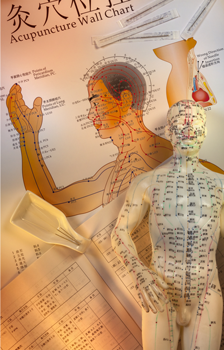 Despite the growing number of acupuncture treatment zones, most acupuncture physicians use the traditionally identified points on the 14 main channels. Each channel has a small number of points used repeatedly for their versatility in treating a wide variety of diseases. Each point is associated with a list of disorders and diseases they can help treat, but sometimes a practitioner will select points based on the Chinese theory of balancing the qi flow — or energy flow — in the channels. So a point might be used during treatments for other kinds of disorders aside from those listed on the acupuncture points chart, due to its usefulness in this balancing process. This point is located on the back side of the hand between the thumb and first finger. The primary use of this point is to relieve pain and treat inflammatory and feverish diseases. This point is located above the wrist on the inside of the arm. It is used to treat several disorders of the upper body, including headache, neck stiffness, cough, asthma, sore throat, facial paralysis and wrist conditions. This point is located on the front of the leg, just below the knee. It is helpful for digestive disorders. Research shows that using this point results in positive effects in treating anemia, immune deficiency, fatigue, and numerous diseases. This point is located on the inner side of the leg just above the ankle. Although it is on the spleen channel, which generally influences the digestive system, this point is also valuable for treating hormonal disorders (such as irregular menstruation) and immune disorders. This point is located at the base of the skull where it joins the neck in back. It is used in the treatment of acute disorders, such as the common cold, influenza, headache, neck pain and fever. In addition, it lowers blood pressure. The point is located on the top of the foot, between the first and second toes. It is used to balance emotional energy, to regulate menstruation, to reduce pain in the chest, treat eye disorders, alleviate headaches, and reduce high blood pressure. This point is located on the inner arm, just above the wrist. Like other points on this meridian, it is useful for cardiac disorders, such as heart palpitation and angina pectoris. It is also useful for nausea, vomiting, spasms and convulsions. This point is located on the outer side of the wrist. It is used in the treatment of a variety of mental disorders, such as absent mindedness, insomnia, disturbing dreams, hysteria, depression, agitation and mental illness. It is also used in the treatment of heart disease and fatigue. This point is located at the back of the knee. It is utilized in the treatment of back pain, hip impairment, muscular atrophy, leg pain, abdominal pain, nausea and many other ailments. This point is located just behind the inner ankle. It is used for disorders in several areas of the body, including sore throat, toothache, deafness, tinnitus, dizziness, asthma, thirst, insomnia, lower back pain and menstrual irregularities. This point on the channel is located on the outer side of the arm, above the wrist. It is mainly used in treatment of disorders along the pathway of this meridian, that is, of the fingers, hand, arms, neck, ears, cheek, and top of the head. This point is located on the side of the hand, below the little finger. It is used for treating mental disorders, stiffness and pain in the neck, seizures, night sweats and fevers. This point is located at the top of the head. It is traditionally applied in the treatment of various mental disorders, and for headache, vertigo, ringing in the ears and nasal obstruction. For information about our acupuncture school, contact admissions by calling 305-595-9500 or by emailing admissions@amcollege.edu. We are located at 10506 N Kendall Drive Miami, FL 33176.